During last year’s state visit by Emmanuel Macron, the very intellectually curious—perhaps the most intellectually curious man of all time? 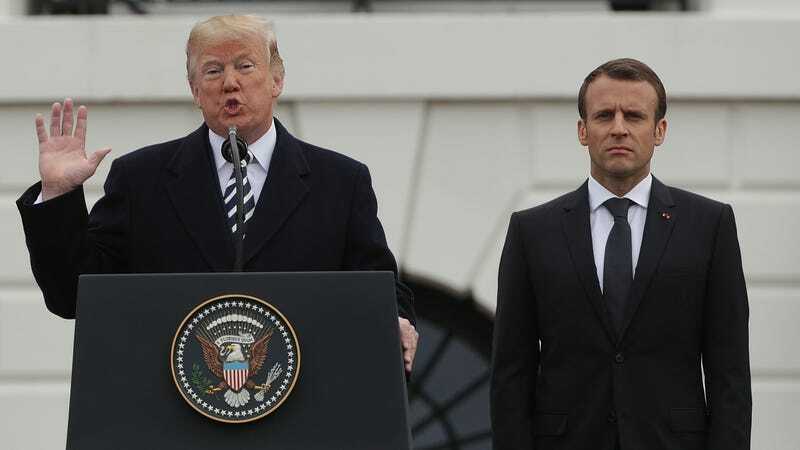 some say so!—Donald Trump took the French president on a guided tour of Mount Vernon, the home of George Washington. Apparently, Trump wasn’t too impressed! Politico has a behind-the-scenes account of the two men’s “truly bizarre” visit to Mount Vernon, where they were shown around by the historic site’s president and CEO Doug Bradburn, who reportedly gave it his absolute best shot but struggled to engage a man who prides himself on his total lack of nuanced knowledge about history or, for that matter, anything else. Trump apparently had some feedback for George Washington on his branding strategy—not so good, according to our current president! The rooms, Trump said, were too small, the staircases too narrow, and he even spotted some unevenness in the floorboards, according to four sources briefed on his comments. He could have built the place better, he said, and for less money. Needs more pink marble and bronze escalators, too.